The April executives networking events brought together many new entrepreneurs to grow their networks and walk away with tangible knowledge. 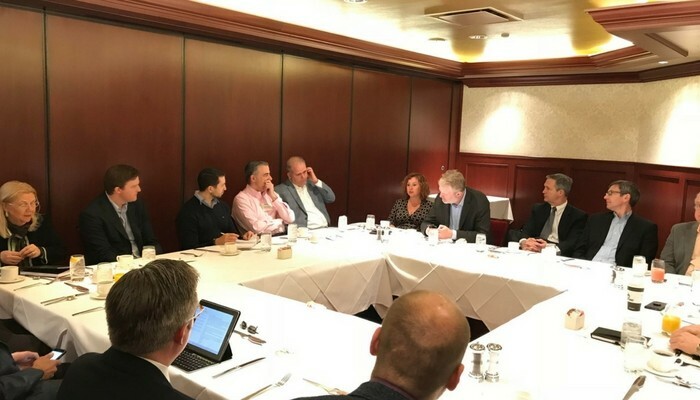 The Executives Breakfast and Luncheon created a convenient environment for entrepreneurs to offer valuable advice and build strategic connections. Dan Porcaro, CEO, PSM Partners: Listened to the CEO of the company who had a formula for integrating companies with an 80/20 rule. Fire 75% of clients and then over serve your current clients. About 90% of revenue comes from the top 25% of clients. Focus assets on the most essential revenue streams. Joanna Sobran, CEO, MXOtech: Read the Pumpkin Plan. If you fill your land with lots of little pumpkins, then the big ones will have no room to grow. Ben Fornell & Mike Dawson, Co Founder & CEO, Shurpa, Inc.